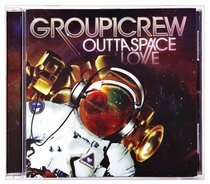 Customer Reviews For "Outta Space Love"
Christian Party Music? Bring it. I can't think of a band that has improved as much in three albums as these guys have. This album is simply excellent. Musically is excellent pop, dance and rap, lyrically not particularly deep but all about Gods love and relationships. Comparisons with the Black Eyed Peas are inevitable, but these guys don't try to just be the 'Christian Version', they hold their own with their unique sound. There is no one in Christian music like these guys and this album is where they hit their stride. Highlights include the title track, the irresistible "Breakdown" and the 60s flavoured "Wait". Love this album! Favourite songs are Live It Up, Walking On The Stars, and Let's Go. The melodies are great and the lyrics are very meaningful.